Once your Rails app begins seeing consistent traffic, slow SQL queries will likely rear their ugly head. Simple things like using find_by_sql can make a big improvement, but how can you easily tell where your app is slowing down? While PostgreSQL and MySQL can log slow queries, it's difficult to gleam actionable information from this raw stream. The slow query logs lack application context: where's the LOC generating the query? Is this slow all of the time, or just some of the time? Which controller-action or background job is the caller? 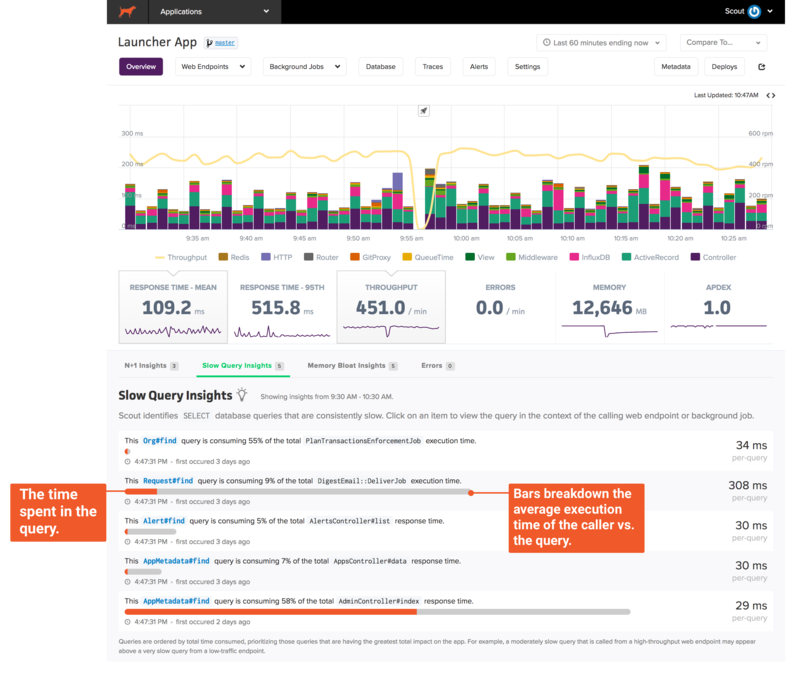 Which queries are most impacting app performance? This is based on the total time consumed of each query, where time consumed is the average query latency multiplied by the query throughput. Which queries are significant bottlenecks inside web endpoints and background jobs? 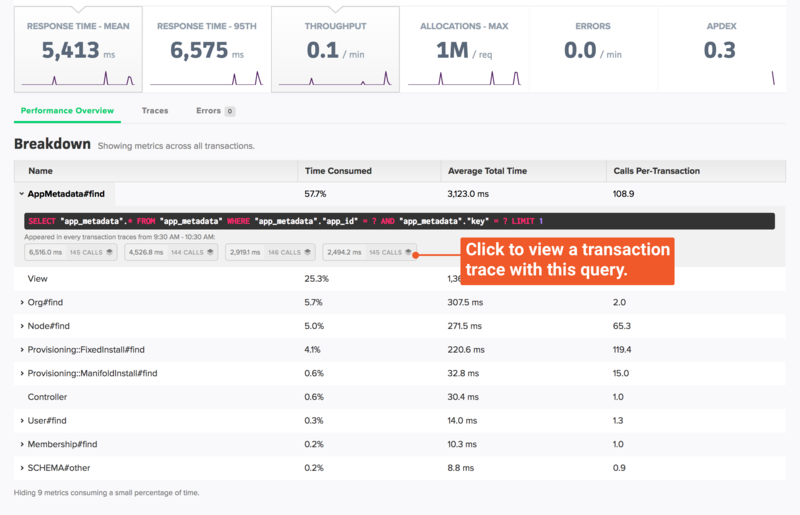 A single query that is responsible for a large percentage of the time spent in a transaction is a great place to investigate for a performance win. Which queries are consistently slow? These are queries that have a high average latency. 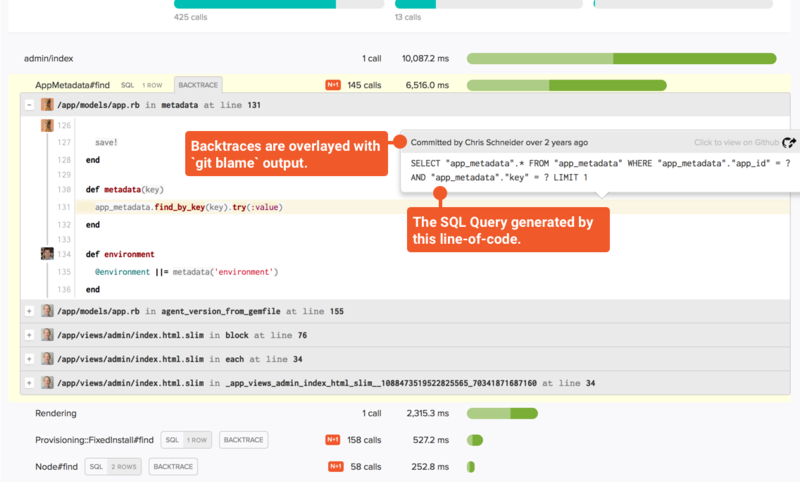 Every production Rails app has slow queries: knowing which are most worth your time to optimize is the challenge. Scout helps you prioritize your efforts and tracks queries down to the source and git commit. Start hunting down those slow ActiveRecord queries today with a 14-day trial of Scout.